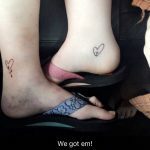 Ten years ago, my then 12 year old, middle granddaughter, asked me to get a matching tattoo with her when she was old enough. 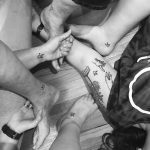 Since her parents were against the idea of tattoos, we decided that “old enough” would be when she was 20 years old. When she asked, I thought about if for a few minutes and decided that the odds of her remembering that eight years later were pretty slim, so I said yes. She drew up a very rudimentary design that we both liked and said that that is what we would get. We set a date for when we would get it, June 3, 2016. 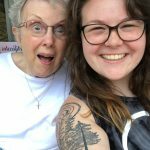 Fast forward eight years, and she is serving at a church camp 12 hours away, and I was going through chemo and radiation, meaning that we couldn’t get the tattoo the 3,163 days later that we had anticipated all those years ago. When I first got diagnosed with stage three uterine cancer, Kate and I agreed to put our tattoo on hold until I got the all clear from my various cancer doctors. In May of 2017, I had gotten approval from my doctors and Kate found an artist that she had been going to, we went in for a consultation. 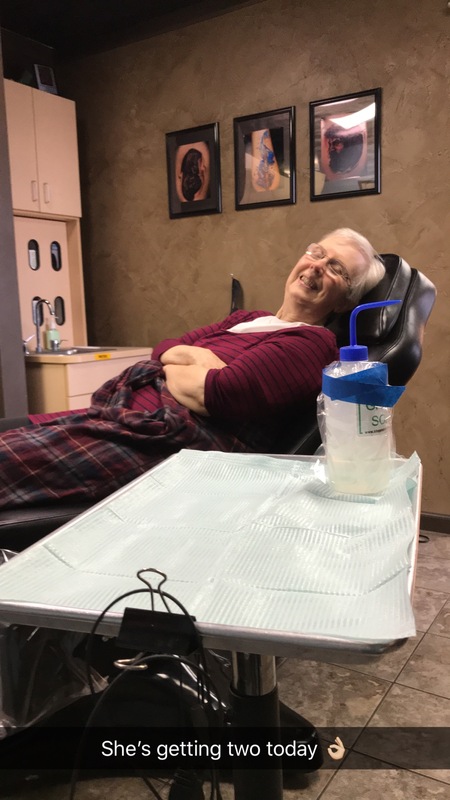 Little did I know what tattoo journey I was getting into… the first tattoo was a small heart with a cross in the middle with three drips coming off the bottom. 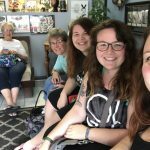 Later that summer, when my daughter and three of my five granddaughters went to Brown County, Indiana we wanted to commemorate our tradition with a tattoo (Kate’s idea of course). The only problem was to convince my daughter, who has been against tattoos from the beginning, to agree to getting some ink. 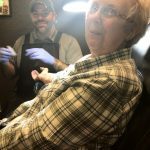 With a little bit of talking, she agreed and we all found a walk-in shop in Bloomington that would give all five of us a hand in the American Sign Language sign for ‘I love you,” a motion the girls and I have been doing to say goodbye for forever. 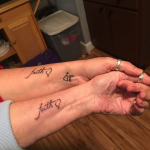 With all of this tattoo talk that weekend, it became apparent that my other granddaughters wanted to get matching tattoos with me too. 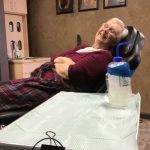 So, in December of 2017, I got matching tattoos with my youngest granddaughter, a sunflower on our ankles. My daughter also wanted to get a matching tattoo with me, so at the same time we got the word faith on our forearms at the Lucky Rabbit. These are the first tattoos that I got done by Dan, and I’ll tell you what, I told the girls that I wouldn’t go to another artist besides Dan from now on. My other granddaughter says that she wants to get a matching tattoo with me, a ball of yarn with each of our favorite Bible verses incorporated. She lives up in Chicago though, and finding a time that she could come down to Muncie is challenging. This past Friday, April 13, is when I got my latest tattoo. God’s hand in Michelangelo’s Creation of Adam in the Sistine Chapel. The past few months in my quiet time many verses keep coming up that have to do with the Father’s hand hold on to mine, and I wanted that reminder on my wrist where I could see it every day. So that’s how I have five tattoos, within a year. And I am planning on getting at least one more. I have opened up the invitation to my other two granddaughters if they want to get matching ones with me too, so I may not be done yet. I use these tattoos to witness to others and as daily reminders. 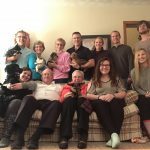 Reminders of my family and my faith. I fully believe that God has blessed Dan with a gift in his artistic ability, in how he views the world and how he interprets that onto skin. I so appreciate getting work done by him, just because I know that it will be done well, and I will have a great time visiting with him as well. ← Meet Atom and Chrissy!